Nothing is more rewarding than working for your prize and Ever Tuff Treat Pod will certainly give your dog a fun challenge. 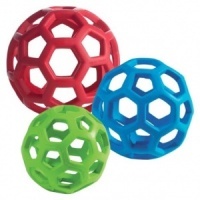 This boredom busting interactive dog toy is fun to gnaw and as the dog chews and plays they also work out how to get at the treats you have hidden in the three pods. Woof! 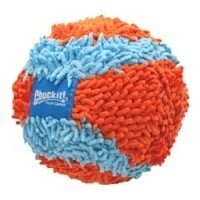 This unique treat toy will engage and challenge your dog. 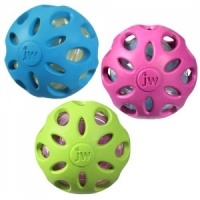 Made of three ThermoPlastic Rubber treat pods threaded onto durable nylon infused with irresistible chicken flavour. No more chewed shoes or nibbled table legs. 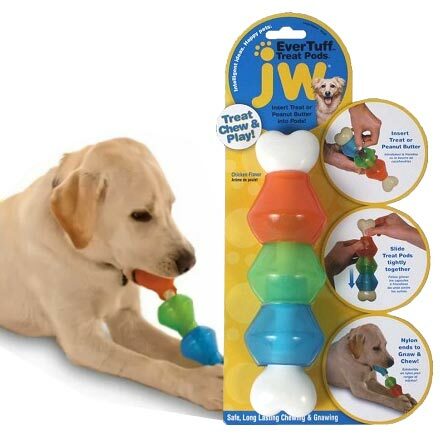 Ever Tuff Treat Pod is the perfect outlet for dogs who have an instinctive urge to gnaw and chew. Go for it my friends. Each pod can hold part of their kibble allowance, treats or even fill the pods with that tasty favourite - peanut butter. Now that’s a challenge! The dog has to manipulate the pods to dispense a treat or reach a bit more of the tasty spread. 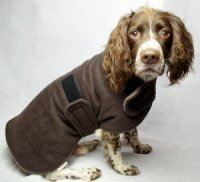 You will be amazed what just 15-20 minutes of brain exercise can do for your dog’s emotional state of mind. Happy, mentally satisfied dogs are much less likely to start creating their own entertainment. And watching your dog play and learn is so rewarding. 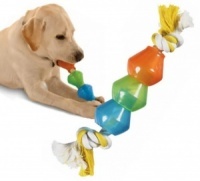 Easy to set up and hours of puzzling fun for your dog. Say “bye bye” to bored dogs. This treat dispensing toy will keep your dog busy and entertained for hours. No toy is indestructible. Always supervise play. This is very good for a dog that's a chewer. Bought for Waltons 1st birthday today and he hasn't stopped chewing it . Difficult to get treats out but he is more than happy to chew the ends. He is carrying it everywhere he goes, he loves it. Keeps the pup amused for quite a while if you stuff treats inside. Great for keeping her busy. Our Golden Retriever adores his new toy which keeps him amused for ages. Cleverly made and reasonably robust. Keep your dog occupied ! Amazing value for a product that my son's 2 dogs absolutely adore. They can now be left alone with no 'mess' left for my son to come home to ! !